One of the things you get with Kodi VidTime is a great selection of sports channels. To install Kodi VidTime addon, you need to first have the Fusion Addon installer properly set up on your device. If you don't have it yet, take a look at our guide to add Fusion Installer to Kodi. This tool will help you install VidTime Kodi plugin in an easy way. The installation will also be easier if you have a wireless HTPC keyboard connected to your device. This will allow you to perform searches easily, using the search feature on Fusion Addon installer. 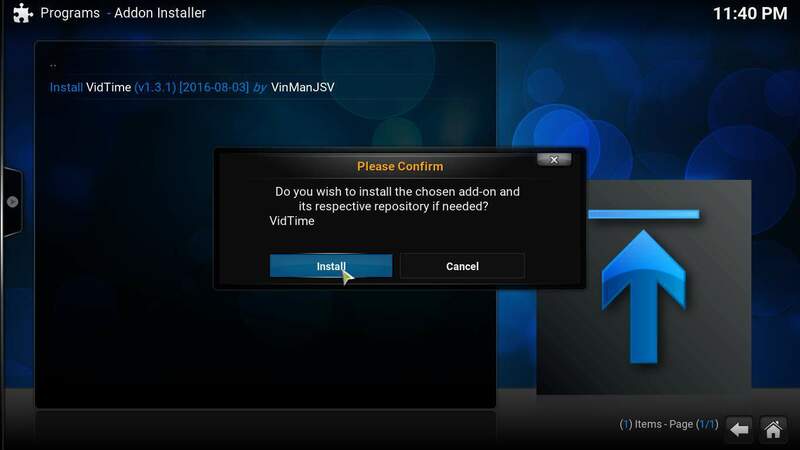 How to install Kodi VidTime addon? Assuming you have Fusion Addon installer ready on your device, head to Programs -> Program add-ons. 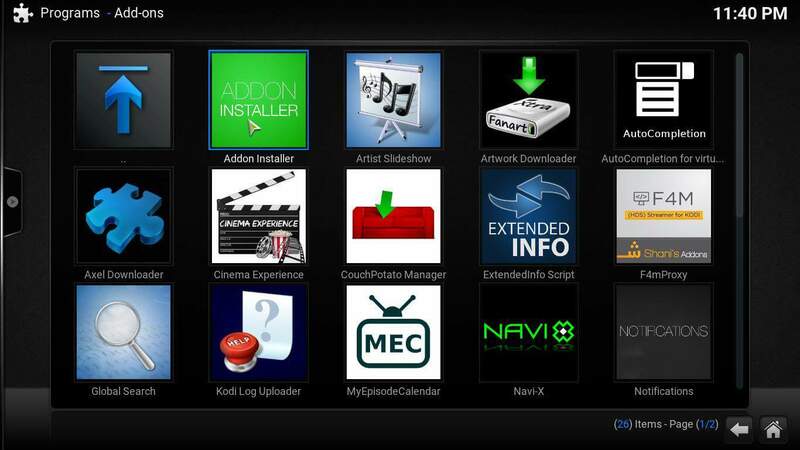 Click on the Addon Installer icon to open the addon and start the process to install VidTime Kodi plugin. Click on Addon installer to start the process. After you open Addon installer, click on the Search by: Addon / Author list item. This will bring a dialog box, where you can type the name of the addon you seek. 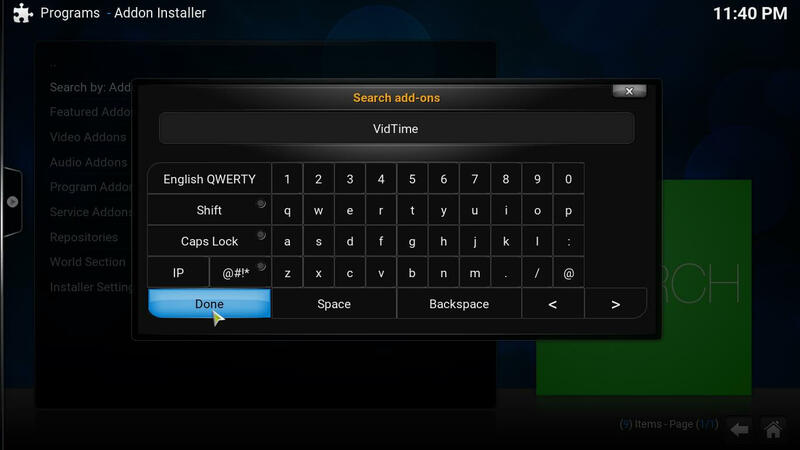 In this case, type VidTime, in order to search for the Kodi VidTime addon. Type VidTime in the search dialog to run a search for this addon in Fusion. After clicking Done, you will be taken to the seach results page. You should only see one option: VidTime. Click on it, and you will be taken to another menu, where you can select the version. There's only one result here as well, so click Install VidTime and this will let you continue the process. A dialog will appear once you click this option, asking you for confirmation to install the addon. Click Install, and the Kodi VidTime plugin will install automatically. 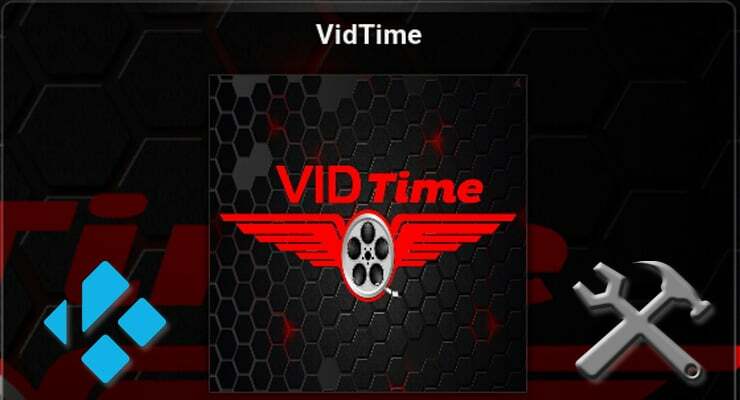 Clicking Install will start the process to Install VidTime Kodi plugin on your media center. Wait a few seconds, and you will see a confirmation dialog, letting you know that the Kodi VidTime addon has finally been installed on your system. Click OK. Congratulations! Now you can enjoy the various streams available from the Kodi VidTime addon, which also include movies, and even music. Interested on more content options? Get movies on your Kodi media center device with these 10 best Kodi movies addons, or listen to your favorite songs with the Kodi MP3 streams addon. 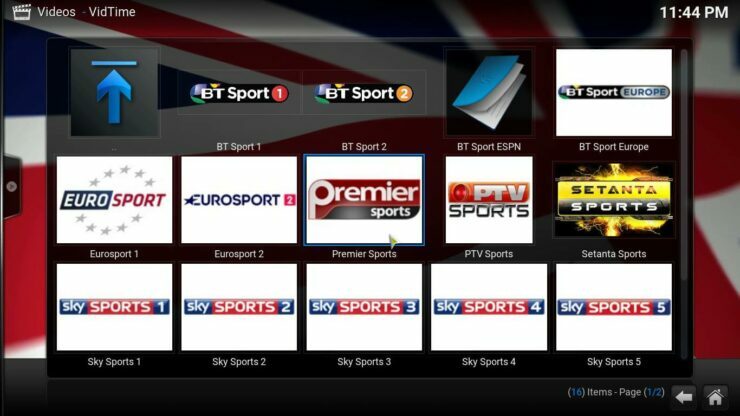 You can also follow the most important sports events with your Kodi device. Watch Rio 2016 Olympics Kodi streams from the comfort of your couch with one of these 10 best Kodi addons to watch Rio 2016 olympics. You can also watch them with Kodi VidTime addon, so give it a try!